The White House has also released a “fact sheet” that adds a few (although not a lot) of details about how President Obama plans to achieve the goals listed in his State of the Union speech. 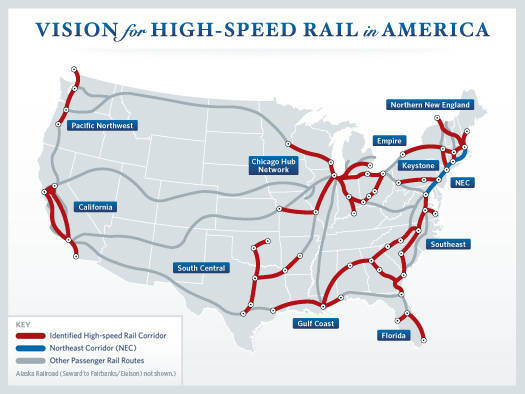 Here is the high-speed rail network that President Obama proposed in 2010. In the time since, Ohio and Wisconsin have lost federal funds due to lack of political support for projects in both states. Map by U.S. Department of Transportation. Repairing roads, bridges and transit: The President’s Budget will outline a comprehensive, six-year plan to leverage our resources to repair crumbling roads, bridges, and transit. It will feature up-front investments that will both help generate hundreds of thousands of jobs now and lay a foundation for future economic growth that will benefit all Americans. It will also include transformational investments such as an infrastructure bank that will revolutionize infrastructure finance, leveraging government resources through attracting private capital to build projects of national and regional significance. The President is committed to making sure that this infrastructure program is fully paid for, and free of earmarks. Increasing access to high-speed rail: The President is proposing a significant down payment on a national rail network so that, within 25 years, 80 percent of Americans have convenient access to the high-speed rail system, cutting travel time in half relative to driving a car. This new system of high-speed and intercity passenger rail will connect communities, reduce travel times and congestion, create skilled manufacturing jobs that can’t be outsourced, and spur new innovations by the next generation of American entrepreneurs. The most interesting part is the nod to an “infrastructure bank,” which could help the 30/10 Initiative. Attentive readers know that the 30/10 plan seeks to use federal loans and other financing to build Measure R transit projects in the next 10 years instead of 30. A bank could be created as part of the next multi-year federal transportation spending bill, which Congress may tackle this year. It’s already two years overdue and it will likely be a challenge, given the noise that both political parties are making about cutting federal spending.